The pharmaceutical and life science industry is among one of the most heavily regulated and scrutinized in the world. These businesses are constantly adapting to numerous regulatory requirements set by governing bodies around the globe like Health Canada and the FDA. Business practices for these life science companies must be compliant with regulatory and quality requirements in order to continue operations. But failure to comply with these regulations could be very costly for the company, resulting in fines, remediation costs, or worse, irreparable damage to the company’s reputation, leading to a shutdown in operations and the start of an investigation. It’s challenging for pharmaceutical and life sciences to swiftly integrate these requirements into their business practices, while keeping up with emerging technology and industry risks. Unfortunately, there’s not enough time for these companies to quickly incorporate these regulations into the business operations. So the question is, how do you ensure compliance? The key is to start with the business processes. Enterprise Resource Planning (ERP) systems are what supports the core process of a business. It’s made to collect, store, and distribute information regarding activities of all departments. But not all ERP systems are made the same. Most of the available software isn’t constructed to do the one thing that life science companies need the most—ensuring compliance. Microsoft Dynamics is a flexible and scalable solution for mid-sized to large businesses. The user interface is modeled on Microsoft Office products, to give users a familiar and intuitive feel. Furthermore, it doesn’t have the implementation complexities of other tier 1 ERPs that life sciences companies use. In a post by BDO Solutions Canada, they explain why Microsoft Dynamics is a great solution for pharmaceutical companies. It goes into depth about each capability of the software such as: Formula Management, Inventory Management, Sales Management and Production Management. In addition to these features, there is also a full range of computer system validation services for any solution interfaced with AXOQCS. 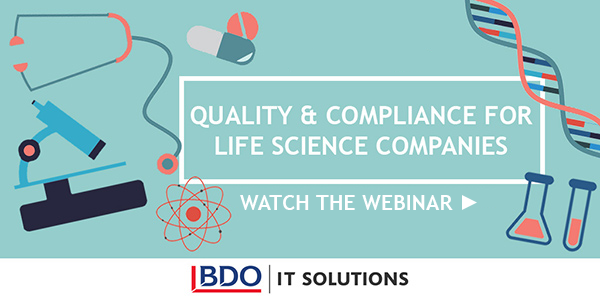 AXSource and BDO hosted a webinar on November 22 2016 to showcase how AXOQCS turns Microsoft Dynamics into a complete ERP for life sciences companies.